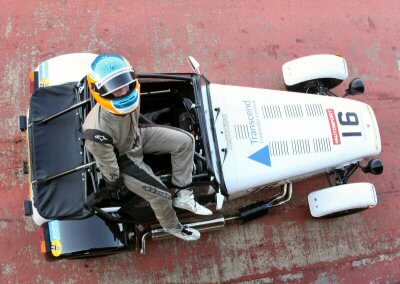 David Robinson dominated the Caterham Academy Autumn challenge at Rockingham by setting pole followed by two race wins with the two fastest laps. David Robinson set the scene by gaining pole with a 1:45.05 some 0.146 seconds ahead of next best Paul Thacker, with the rest of the field being a distance behind. This trend continued into race one with Robinson being the only man to get beneath 1:45 with a stunning 1:44.954, 0.7 seconds ahead of Paul Thacker and establishing the lap record for the International Long version of this circuit. Delivering consistent and rapid lap times enabled Robinson to take the chequered flag a full seven seconds ahead of Paul Thacker. Race two proved to be more of a challenge and showed that Robinson and Thacker were racing in a different league to the rest of the field. Robinson sealed the day with a further win and fastest lap. This time Robinson’s lead over Thacker was just 1.4 seconds with Robinson’s fastest lap being just 0.05 of a second ahead. Third placed man Robert Smith was a massive 19.4 seconds behind the leading duo.